A year after celebrating their first trip to the playoffs this millennium, the Bills are, frankly, a disaster. They’re 0-2. They’ve been outscored 78-23 by the Ravens (47-3) in Baltimore and the Chargers (31-20) in Buffalo. And now they head to U.S. Bank Stadium as a 17-point underdog — their most lopsided point spread since they lost at Miami as an 18-point underdog in 1985. That won’t be easy based on what’s on tape. Rookie quarterback Josh Allen, the seventh overall pick out of Wyoming, was the proverbial deer in the headlights in his NFL starting debut last week. Meanwhile, the defense looked more like the deer that doesn’t get out of the way of an 18-wheeler going 70 mph. Old friend Leslie Frazier had his play-calling duties as defensive coordinator stripped at halftime. And that was only the second-most dramatic event that occurred at the intermission. Starting cornerback Vontae Davis did something he could regret the rest of his life when stunned the league by retiring after 10 seasons — or nine seasons and six quarters, to be exact. With Frazier calling the plays, Buffalo’s defense gave up 75 points in six quarters. After head coach Sean McDermott took over the play calling, the Chargers scored only three points in two quarters. Of course, the urgency to pile up points is reduced when a team is already leading 28-6. Since then, McDermott has all but confirmed that he’ll continue calling the plays. Buffalo and Arizona are the two worst teams in the league. The opinion here is Buffalo is worse because Allen is so incredibly raw, Nathan Peterman isn’t an NFL-caliber player, and the defense looks lost. 11:26 of the first quarter: The first of the Chargers’ five sacks comes on a four-man rush that confuses and freezes Allen. Rookie safety Derwin James rushes while a front-seven defender drops. James is six yards deep when he starts an impressive rush. Allen is slow to spot it, doesn’t look for his hot receiver, sidesteps James and gets whacked from the blind side. Chargers’ third possession of the game: Melvin Gordon scores one of the easiest 20-yard rushing touchdowns you’ll ever see in an NFL game. Los Angeles sends a tight end in motion from left to right. At the snap, almost the entire defense seems to guess that the play is going to the right. The Chargers run a counter play to the left and Gordon basically trots into the end zone for a 14-0 lead. Later, Gordon scores untouched again on a 9-yard reception for a 21-3 lead. 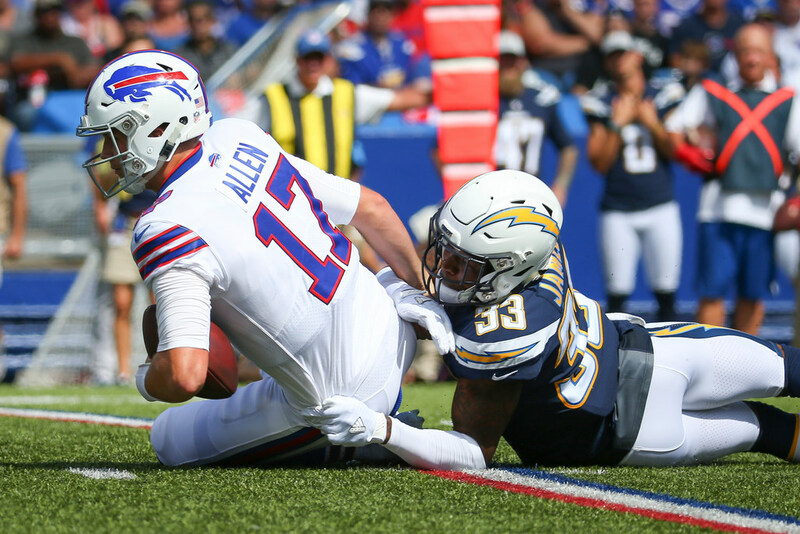 Start of the second quarter: The Bills have the ball at the Chargers’ 21-yard line trailing 14-0. Against a four-man rush, Allen looks deep left, clearly locking his eyes on his first option. As the pressure mounts, his head never turns to the right, where his check down is an uncovered tight end with the nearest defender five yards away . It’s as though Allen doesn’t even know the tight end is running that route. A simple bail out would have gotten the first down or more. Instead, Allen waits too long on the receiver that’s covered and is dropped for an 11-yard sack.